Lync Server heavily relies on domain name system (DNS) for name resolution and service lookups. Since Lync is always installed in an Active Directory environment, which also requires DNS, this service is typically already in production before the installation of Lync, and therefore simply needs to be configured to meet Lync requirements. A very basic Lync deployment involving only the core services requires only a few DNS records. However, as additional Lync features and services are deployed in the environment, quite a few additional DNS records might be required. For example, edge services, the Device Update Web service, and Lync Mobility all have specific DNS requirements. In this section, the DNS records required to allow basic Lync functionality are covered. Lync Server requires registration of the hostname for each Lync server as an internal A record. For Standard Edition, a DNS A record that resolves the fully qualified name of the pool to the IP address of the Front End server is also needed. For Enterprise Edition Front End pools involving a hardware load balancer, a DNS A record that resolves the fully qualified name of the pool to virtual IP address of the load balancer is needed. 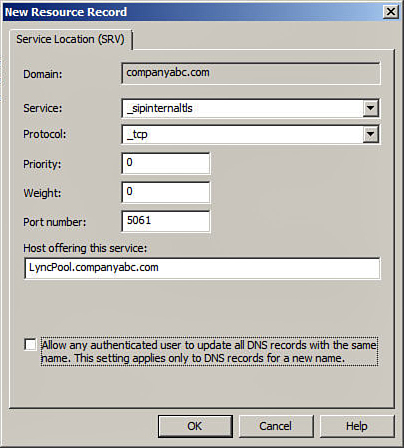 Although the sample DNS configurations just shown can be used to meet the minimum requirements for Lync, many organizations rely on the Lync client’s capability to automatically find the Lync pool and sign in the user, an optional but very useful feature. To provide automatic client sign-in, an SRV record is required for _sipinternaltls._tcp.<domain> over port 5061 that maps to the fully qualified name of the pool. For example, Figure 1 shows the configuration of the SRV record that would be added to the sample DNS configuration shown previously to provide automatic client sign-in for the companyabc.com Lync deployment. Figure 1. SRV record used for automatic client sign-in. Note that SRV records hold information that is not used with other types of DNS records, such as priority, weight, and port number. In addition to specifying the location of the service, this information provides a means to influence how the incoming traffic load will be shared or directed. For Lync deployments that use several SIP domains, one SRV record is required for each domain to support automatic client sign-in.